Fig and blue cheese stuffed pork tenderloin. It. was. so. good. I made garlic sauteed green beans and wild rice cooked in a mushroom broth to go with it. We had the Therapy Vineyards Chardonnay. The pairing was good, and the meal was fantastic. 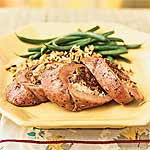 And get this: the recipe for the pork tenderloin is from Cooking Light! You can find it here. The great thing about this recipe also is that it's relatively inexpensive. Pork tenderloin is very reasonable, and the small amount of blue cheese is inexpensive though it adds so much. I'm on a new kick to eat at the table. Okay, maybe you all eat at the table every night. But, we live in a smallish apartment and have gotten into the habits of a)using the kitchen table as a dumping ground or "hot spot" as fly lady would say and b) eating nearly all meals in front of the TV. We're trying to live more healthfully and every single health guideline, weight loss plan etc. says "DO NOT" do other things while you're eating. Do not watch TV, read, drive etc while eating. Okay, so here's what I did to combat our TV eating: 1) Created a "mail centre" to drop all the mail and pens and bits and pieces that were collecting on the table. 2) Put 2 place mats on the table. This doesn't sound like much, but so far it has helped. Especially the place mats- I walk in with my bag, purse, mail, groceries, but when I reach to put them on the table and see the place mats, I redirect them to where they should be stored (bag- in office, purse- on hook, mail- mail centre, groceries - put away immediately). So, with the table clear, it is easy to eat there. We had a candlelit dinner tonight :-). So...here's to hoping we can keep up the trend. I really really want to defrost the other pork tenderloin in the freezer and make this meal again! Posted by T. at 8:18 p.m.